Prayer times is a most popular app in the world. 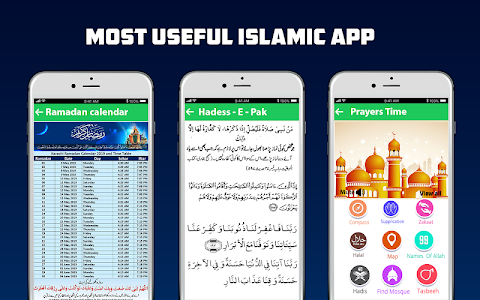 Athan prayer time is also famous for Muslim ummah app. Adhan and prayer time gives athan time notify to the Muslim people. Five times prayer is an Islamic prayer time app. 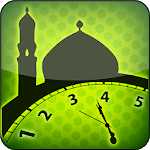 Muslim prayer times app work as an azan time alarm. Prayer times have a much Islamic religious education. Prayer times (أوقات الصلاة) is most common and famous application in Muslim world. This is most used and recognized by the Muslim Ummah as Muslim Prayer Times & salah times. It helps to find correct Salat times, Qibla direction & prayer times alert as Islamic finder. Salat reminder reminds call for prayer with different beautiful azan voice alarms. Salah (الصلاة) is important worship of ALLAH. All Muslims offer 5 times salaat in a day. Offering prayer on time is much important. So this is Muslim prayer app that helps to remind 5 salah times. It is nicely calibrated the prayer timetable for most locations in the world. It is also Qibla direction compass to find Qibla direction at any place. Moreover, also helps to find mosque in local area as nearest mosque. 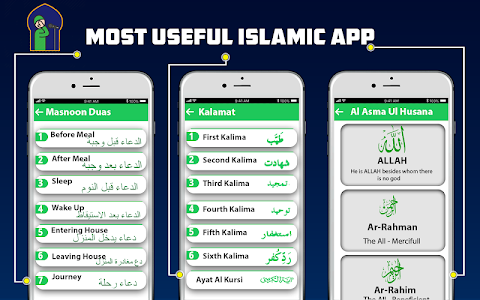 This is complete salat timings as Islamic app as spare time and call to pray. There are attractive and beautiful adan voices for (اذان) azan alarm reminders. It speaks at 5 times a day for prayertime. Prayer timetable is beautified with Islamic pictures. Masnoon Dua’s (supplications) are added for different occasions. Quibble with Qibla direction gives exact kaaba direction. It includes Qibla direction compass for Qibla locator. It is complete Islamic finder and salaah time for Muslims. 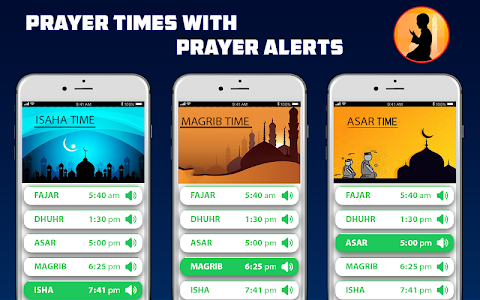 Prayer times app indicates you Azan times with Qibla direction. It also indicates you Islamic supplication and Muslim prayer time with qibla compass. 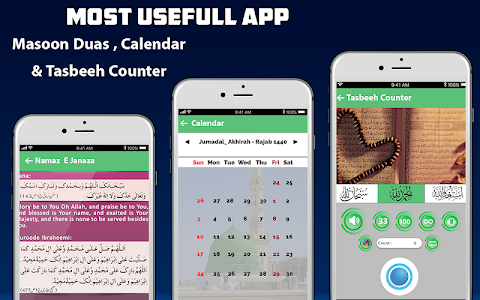 Ptimes Islamic app is indicates you Islamic prayer times. Salat prayer times help to all Muslim in the world as muslim masjid prayer times. There are some important ayahs and Hades which are reminded as daily notifications with frorty Hadith. Also Friday Notification has been included. Notification time can be adjusted in setting panel. - The next prayer time is highlighted to easily alert & catch the next prayer. - The current time and remaining time for the next prayer is mentioned. - Easily turn Adhan alarm On/ Off. - 5 diffrent beatiful azan vocies available. 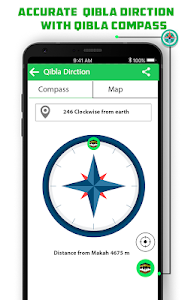 - Qibla Finder gives animated and accurate Qibla compass that gives the way and direction towards the holy Kaba in Mecca. For suggestion and feature updates, Please contact us on. Similar to "Prayer Times — Azan Time and Qibla Direction"